Aspyr Media has announced the release of Sid Meier’s Civilization IV: Gold Edition for the Macintosh. It costs $50. Civilization IV Gold Edition combines the original Civilization IV with the Civilization IV Warlords expansion pack. Civ IV: Gold Edition combines the original Civilization IV release with its expansion pack, Civilization IV: Warlords. Both were available before now, but this combines both games in one package for those gamers who want them but haven’t yet purchased them. Civilization IV is the latest in the long-running series of computer games that enables you to raise a human civilization from its first tribal stirrings as a stone-age people straight through the age of modern technology. 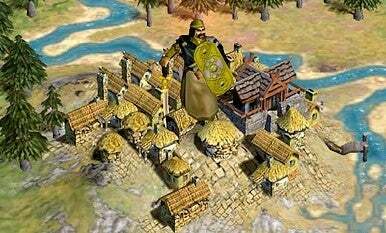 Civ IV features a detailed 3D environment, and sports new ways to win and play, new tools to use to manage and expand your civilization, new mod capabilities and multiplayer modes and options. Civ IV: Warlords takes the core game and expands upon it. It lets you recruit some of history’s most famous (and feared) military leaders, and adds eight new scenarios to the game, adding a “Warlord” unit for new gameplay. New civilizations, leaders, units and “Wonders” enhance the game further. Civilization IV: Gold Edition is rated E10+ (for everyone age 10 and older) by the ESRB. System requirements call for Mac OS X 10..9 or later, G5 or Intel-based Mac operating at 1.8GHz or faster, 512MB RAM, 3.5GB hard disk space, ATI Radeon 9600 or Nvidia GeForce FX 5200 or better 3D graphics with at least 64MB RAM.